Smetana means cream – seems strange to think that The Moldau was composed by Mr Cream. Absinthe is all the rage here. 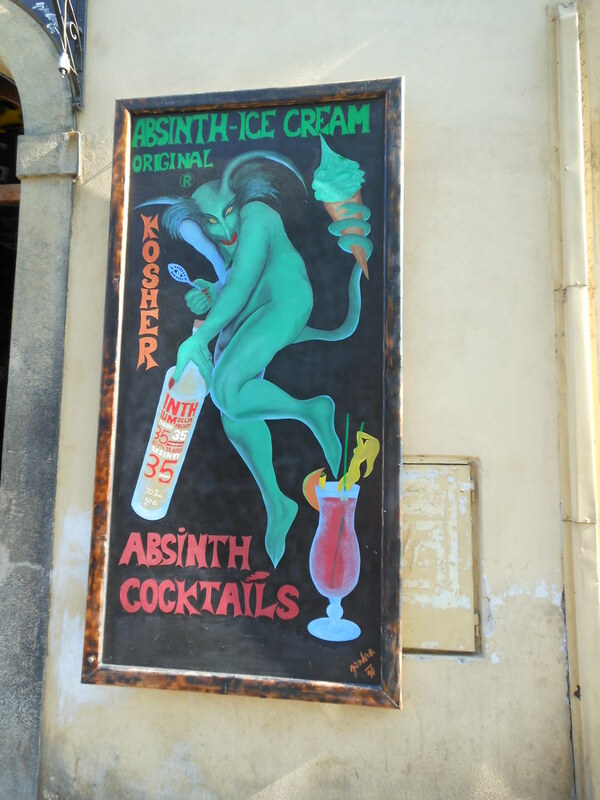 There are shops specializing in all things absinthian including Absinthe icecream. They have marijuana vodka as well. The police detail on the US embassy is still there, so it wasn’t just for 4 July. They do a pretty cursory inspection in my opinion. Prague has few cyclists and lots of trams, most of them charmingly retro in style. Because its a national public holiday today, the trams are decked out with Czech flags. Boiled broccoli was a menu item at a cafe we passed. We are so behind the times in Adelaide regarding the inclusion of boiled vegetables in our cafe offerings. Unusual museums: two Museums of Torture, one medieval, the other presumably regular as type not specified; Museum of Communism as well as the previously mentioned KGB Museum; Beer Museum – actually more a bar pretending to be a museum. Hells Angels have a Bohemia chapter – saw a member but was not game to photograph him in case he was sensitive to that kind of thing. This entry was posted on 5 July 2012 at 12:48 pm and is filed under Czech Republic. You can follow any responses to this entry through the RSS 2.0 feed. You can leave a response, or trackback from your own site.